I have just spent a couple of hours on Sunday morning in cafe nero’s and time in the city centre of Peterborough. The hope was to be available for people to talk to and ask for prayer. It kind of worked… people were curious as to why I was available to listen and one lady said that she was alright this morning and didn’t need to talk and then proceeded to talk about her worries for a few minutes. If you had to measure the success of having ‘signs’ that communicated something that would prompt questions and bring a point of contact, it would be in making me aware of those around me. 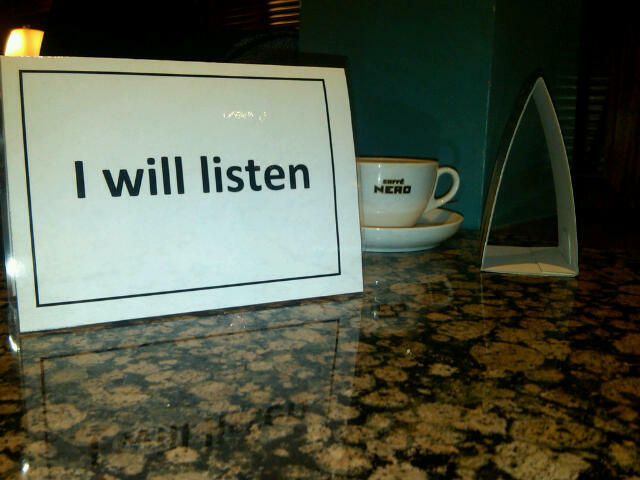 It is very difficult to sit with a sign declaring ‘I will listen’ and then ignore everyone who entered the coffee shop! Those who I communicated with about the purpose of the sign seemed to appreciate the gesture. Matt my friend sat in another part of the cafe and a couple sat near him. He listened to their stories of holiday travels, family and their 50th wedding anniversary next month. Afterwards the lady apologised for ‘bending his ear’ to which he replied that he didn’t accept her apology as she, her life and stories are valuable. I’m hoping that these rather quirky signs may in some kind of light hearted way communicate something of the most amazing message this world has beheld. Nice one, Chris! Like this idea, as too often we’ve been guilty of talking too much, rather than listening… after all we have TWO ears, 1 mouth?